Make yourself at home in one of the 4 guestrooms featuring DVD players. Complimentary wireless Internet access is available to keep you connected. Bathrooms have bathtubs or showers and hair dryers. Conveniences include desks and coffee/tea makers. 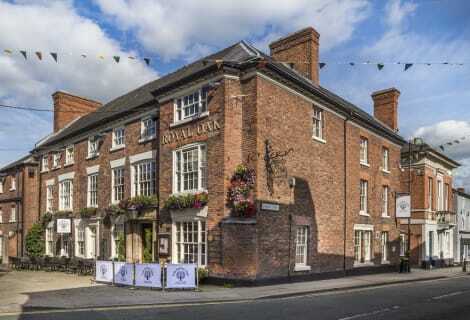 With a stay at Royal Oak Hotel in Welshpool, you'll be within a 15-minute drive of Powis Castle and Montgomery Castle. This hotel is 23.1 mi (37.2 km) from Lake Vyrnwy and 10.9 mi (17.5 km) from Llanfyllin Workhouse. Make yourself at home in one of the 2 guestrooms featuring DVD players. Complimentary wireless Internet access is available to keep you connected. Bathrooms have showers and hair dryers. Conveniences include desks and coffee/tea makers, and you can also request cribs/infant beds (complimentary). Located in Welshpool, The Talbot Hotel is within a 10-minute drive of Montgomery Castle and Powis Castle. This inn is 22.7 mi (36.5 km) from Lake Vyrnwy and 31 mi (49.9 km) from Ludlow Castle. At The Red Lion Inn, enjoy a satisfying meal at the restaurant. Quench your thirst with your favorite drink at the bar/lounge. A complimentary full breakfast is included. Situated in the upper reaches of the Severn Valley close to the border between England and Wales, Welshpools Hotels make an excellent base for exploring historical building and picturesque countryside. Welshpool is surrounded by a number of impressive historical sites. A short journey from the town will take you to Powis Castle, a grand medieval castle that was originally built by the Welsh princes to serve as a fortress, but has been used as a country mansion since the 16th century. The castle houses one of Wales' most magnificent collections of textiles, armour, jade and ivory in the Clive Museum. The castle also features expansive grounds, including formal gardens, a deer park and a range of parkland – ideal for days outdoors with the family or romantic walks along secluded pathways. One castle that hasn't survived as well as Powis Castle is the nearby Montgomery Castle. The castle was constructed during Henry III's campaign against Llywelyn ap Iorwerth around 1223. The stone castle was built on the site of an earlier motte and bailey castle, called Hen Domen, between 1071 and 1074. The ruins of Montgomery Castle and Hen Domen are a short distance from Welshpool and what survives is still worth a visit. One more interesting historical location in Welshpool itself is the Cockpit, a six-sided brick building built in the 18th century and used as a venue for cockfighting until the practice was outlawed in 1835. The best place to learn about the heritage of the Welshpool area is the Powysland Museum. Housed in a converted former warehouse on the Montgomery Canal, the museum has a number of fascinating exhibitions about the development of life in Montgomeryshire from prehistoric periods to the 20th century. Another interesting museum in Welshpool is the Andrew Logan Museum of Sculpture, featuring a range of colourful exhibitions alongside a number of talks and live events. Welshpool boasts plenty of picturesque outdoor settings. The Derwen Garden Centre is a pleasant place to spend an hour or two perusing through beds of expertly arranged flowers, as is Dingle Nursery and Garden. For something a touch more dramatic, Powis Castle features a range of beautiful gardens. A short drive will take you to Glansevern Hall, a Greek Revival House that encompasses 25 acres of parklands. From lakeside paths to impressive rock gardens, Glansevern Hall is a fantastic place to relax outdoors.